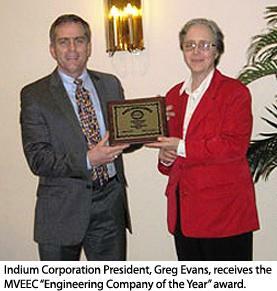 Indium Corporation was recently named 2010 Engineering Company of the Year by the Mohawk Valley Engineers' Executive Council (MVEEC). This award was designed to honor companies for "significant contributions in new and/or innovative products, processing technologies, or productivity leading to enhanced business". The Mohawk Valley Engineers' Executive Council (MVEEC) is a volunteer-staffed, non-profit organization, focused on supporting and expanding the knowledge base, functionality, and business of technology in the Mohawk Valley. For more information, visit http://www.mveec.org/. Indium Corporation is a premier materials supplier to the global electronics, semiconductor, solar, thin film and thermal management markets. Products include solders, performs, and fluxes; brazes; sputter targets; indium, gallium, and germanium chemicals and sourcing; and Reactive NanoFoil®. Founded in 1934, Indium has global technical support and factories located in China, Singapore, South Korea, the United Kingdom, and the USA.